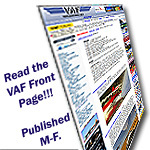 1) Scan links for valid VAF pages before saving them. 2) Enable images in the site directly. Storage is not an issue today [ed. It is is you're the guy having to pay for that space!!! <g> dr]. Then they get resized automatically by the forum software and presented uniformly. Imagery is everything today. 3) Use a password manager like LASTPASS that would not fill in a password for VAF unless the website was a valid URL. The entire issue of bad links would basically be defeated with those additional pieces of effort. Last edited by DeltaRomeo : 09-05-2016 at 07:08 AM. The above email is responding to WTB requests and trying to scam your money. Be careful. 2) Enable images in the site directly. Storage is not an issue today [ed. It is is you're the guy having to pay for that space!!! <g> dr]. Then they get resized automatically by the forum software and presented uniformly. Imagery is everything today. I think replies to a post should be a separate reply so we can properly see those. Otherwise edits by dr make sense if there is a mistake or something contrary to site guidelines but that is his call to make. I will reply here to the edit but tell me if there is a better way to handle this reply please. Imagery has made huge changes in our ability to present information and help and fixes. On another aviation website that I maintain the prior method of delivery was email and you can imagine it was cumbersome. After two years of demonstrating, we switched to a system similar to what dr has created here (not nearly as nice or populated) but we reply primarily on the massive improvement in images, videos and more. We have unlimited storage and our costs are included in the base website so we have many many GB of storage but it does not affect performance. We can upload full size images at the submitter's PC or device. Our website resizes them for presentation in the forums and scans any links. We can also include links to offsite photos. Those links are scanned to ensure images only are presented so we avoid links that are warned above as being dangerous. If someone wants the full image they click and that is presented. With typical residential speeds these images are immediate and super detailed. We are finding people putting large summaries of a build on a topic with images for people to follow. It costs our site nothing. But even if there was a cost I would ask for the appropriate donation to cover it. It would be covered immediately I'm sure. Additionally, with a small change we are now able to upload up to 20 images at once from any device like an ipad or phone. That has tremendous value. In short, I have not seen any incremental cost (today) for image storage from my provider but clearly this is a larger site. At the same time MS gives me a free terrabyte for my OneDrive so I can't imagine much additional cost if every member here uploaded a couple of gigabytes monthly. Embedding YouTube videos in posts (free, no storage required) has also been a fabulous addition. With those issues handled as above, we have zero fraud threats and no alerts required in 5 years I've been involved. [touch wood]. I've had two scam attempts in the last week for a WTB post I have here. kswin342 and cath sapp were the names. One guy sent me pictures of exactly what I wanted and at a fair price. I left clicked the image and then right clicked the larger image which brings up a "search google for image" function. That exact image was from another sale awhile ago from some other forum. Scammers are all around the world through both aircraft and auto sites. Stating the obvious we need to be aware, as the scammers are getting more and more of our details and coming through as more genuine. I'm even finding telecommunication and energy suppliers who I use contacting me - or I think they are - until I check and find its scammers whom are using logo, letterheads, addresses, phone numbers and even real people identities. I bought an Icebox from Phillip Angert when they first came out. When I bought my RV with an engine pre-heat system I also purchase his Switchbox. I have had problems with the unit and within a couple of months I was unable to access it via text message or phone call. I notified him of that a couple of months after it arrived. I could still use his android app but I found that it was unreliable and didn't always work. Fast forward to now and the app stopped working. When I inquired I was told there was a bug that they were working on it. There has been a lot of back and forth contact and he initially said that he would repair it at no charge, but now he says that there would be a min charge of $100 (plus shipping both ways) and that they have repaired others with new circuit boards and firmware for $100. Today the price jumped to $150 for new circuit boards but I could upgrade for $200! There was another issue with a supposedly "Free photo shoot" that suddenly caused a $200 fee to be generated. Van's owners should be aware of these practices and use caution dealing with Phillip for anything. How long ago did you get the switchbox? The so called new App came out about 2-years ago and the first version did not work well. After the update to it, the App has worked as advertised. IMHO, I like the old text app better even though I pay for two messages instead of one. I have nothing but excellent support from Phil and have been using the SwitchBox Control for over 3-years. The only issue that I have had was just recently when I ran out of money on my pre-paid cell account. Not a problem with the hardware or vendor but a problem with me forgetting to put money on account. [quote=RV6_flyer;1150096]How long ago did you get the switchbox? I received it in August 2015 and started having problems in November, 3 months later. At first the response from Phillip was good, but he was never able to resolve the problems with the box not responding to text or phone call. "Your box is NOT eligible for a 4G upgrade until it is in working order. If it is INOP, we will not just give you a new 4G board without doing repairs first. Thats not how it works." That could make the cost of doing the upgrade $350 + shipping both ways! Or buy a new box for basically the same price... I think I'll pass on that. If I spend a couple of hundred dollars on a product I expect it to work. All of this caused me to look up Phillip's "shop"
Just scan to the right where the Number 64 is spay painted on the wall. It's obviously a shoestring operation. He basically puts his sticker on someone's product and sells it as his own. Last edited by Plummit : 02-14-2017 at 12:11 PM. Is your phone OS compatible with new app? Mine was not as it was an older phone. (Android) When I got a new phone compatible with the new app, everything worked fine again. My switchbox was the old legacy model. I never upgraded the box. Don't count on google maps and street photos to be accurate either.